E-Commerce has seen drastic change over the past few years. Inventions in technology bring new gadgets in the technology market. We all have a smartphone, and most of us work online through Laptops and PCs. With this, the number of Internet users is increasing rapidly. People have found eCommerce is one of the most reliable platforms to shop online from remote locations. 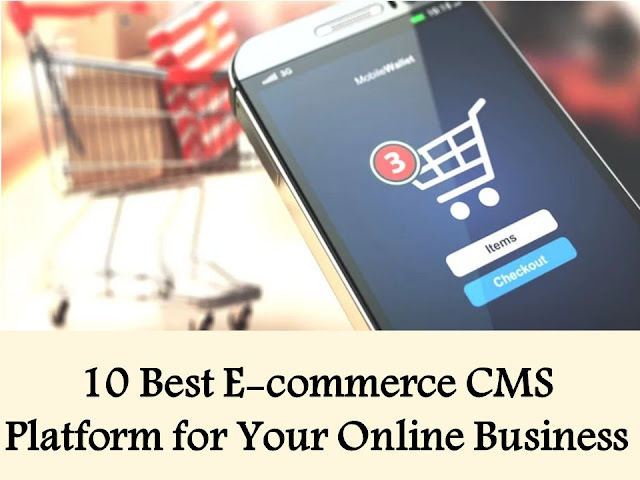 Today, we will discuss the best E-Commerce CMS Platform to boost your Online Business. Also Read: Does your E-Commerce Website be in Require for an Application? Magento is the most popular CMS Platforms in the E-Commerce industry. If you have chosen a reliable ecommerce development company, then you should be suggested to go with this platform by the developers. The platform has an extensive library of different types of demos which you can explore to set up your new online business with. The platform can be used either with its free edition or you can go with the Premium edition of the platform as well. The premium platform will give you more features to use. WooCommerce is undoubtedly one of the best CMS Platform in the market. The platform is highly used by not just small businesses, but also for big enterprises who sell their products online. This platform comes as a Plugin for the WordPress platform which can be purchased easily. The platform comes with plenty of customizable options to start your online store quickly. Shopify is a hosted eCommerce CMS Platform which suits your basic needs. Shopify offers their services through software so you can simply make use of this platform to build and launch your new online store. The platform offers a user-friendly interface to everyone and makes shopping experience much easier for the users. Open Cart is yet another hosted Platform for the Ecommerce industry. This platform serves a unique interface to developers with which, a developer can customize plenty of things while building a new online store using this platform. If you are planning to launch a small business through an online store, then this Platform fulfills your requirements easily. OsCommerce serves much familiar interface to the users. The platform is an open source CMS Platform. The platform comes with quick setup and launch option to start your business in a few hours. It is simple and highly customizable which lets you customize your store the way you want. BigCommerce serves user-friendly interface with advanced cloud-based technology. You don’t need to have an external drive for storing your data, the software itself saves and take a backup of your important files on the cloud. You can try out this platform for 15 days with its free trial version. If you are planning to sell more than one product online, then Wix offers a reliable platform to start your online store. This platform integrates with other eCommerce tools so you can use multiple tools simultaneously without switching them. It runs smoothly and allows you to customize your store the way you want! 3DCart is a platform designed for people with multiple products to sell via the Internet. The platform offers a huge number of designs, tools and options to customize and launch your store in a few minutes. They offer a free trial of 14 days to the newbies. Prestashop is a free to use CMS Platform which is highly customizable. It’s an open source platform which doesn’t require any special knowledge, it comes with easy setup and integration features to launch an online store quickly. The software is specially designed for the small businesses which don’t require extra features. You can easily create, launch and manage an online store using this platform. Volusion is a highly advanced e-Commerce platform available for the web-developers to develop a user-friendly online store for their clients. This platform offers all types of tools which are essential for your online store to setup. It has everything to launch a quick store without special requirements. The platform doesn’t charge any transaction fees which attracts the customers. Depending upon your basic requirements, you can select the desired payment gateways and other options from the Platform itself. with the help of true face paksitani web articles you kwon about the world.